Newman is the subject profiled in the documentary. Hollywood greats Paul Newman and Robert Redford - famous as Butch Cassidy and the Sundance Kid - are to reprise their pairing on screen, it is reported. The two will be seen in a new six-part documentary profile series called Iconoclasts on the Sundance Channel, said Hollywood newspaper Daily Variety. After rave reviews for Butch Cassidy And The Sundance Kid in 1969, the two paired up again for The Sting in 1973. Redford will interview his former co-star for the show. 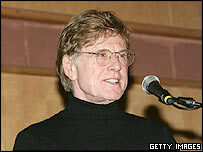 Redford is founder of the Sundance Channel and executive producer of the Iconoclasts series. The series pairs two well-known stars in the roles of reporter and interviewee. Viewers will be able to watch Redford quiz his fellow actor on his life and work, from his film career to his car racing and philanthropy. Jon Kamen, another executive producer of the series, shot the interviews to be woven throughout the hour at the Westport Country Playhouse and at Newman's home in Westport. In another pairing in the series, Christiane Amanpour, CNN's London-based correspondent, will find herself the subject of questioning from film actress Renee Zellweger. The two talked in New York this week at the former site of the World Trade Center and at CNN studios. Another interview will see REM frontman Michael Stipe questioned by chef Mario Batali. The series begins on 17 November with Samuel L. Jackson chatting to basketball legend Bill Russell. 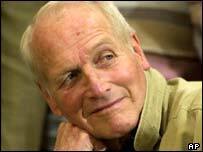 The Newman and Redford programme ends the series in December.